Not too long ago, we took one of LaserMax’s guide rod lasers to Afghanistan; and into the longest war, our country has ever been involved in. Before going further, it is important to clarify that daily gunfights are not a common occurrence from our point of view. We are there to mentor and train those who are slowly [but surely] taking back their country. Our end use for the guide rod laser [in this environment] solely pertains to defensive hand-gunning and training. We were able to conduct a series of tests with the laser that could and would have made kinetic operations more efficient if they would have been a thing [for us]. In either case, we ran the laser through the house in CQB, on flat – static ranges while honing fundamentals of marksmanship and throughout dynamic range operations; while shooting around obstacles and moving. Throughout each application, the laser functioned as it was supposed to and without fail. For the better part of 14 years, Glock has been our first and only choice of sidearm. Partly because of contractual obligations with the Government agencies we were contracted by and partly because…well, it’s an obvious choice for reliability and doing what we need it to do! It is very difficult not to adopt the same opinion while at home. As for this test subject, there is little difference between our overseas laser and this one. The one overseas fit a model 17, whereas this laser was made for the 19. Our initial installation was to fit a Gen4 19 with a Salient Arms International slide; since custom EDC pistols are all the buzz these days. Throughout function testing, the laser operated as designed, without malfunction despite the lightening ports, SAI trigger, and springs. Since not everyone is into customizing their EDC pistol and for the sake of perspective, not everyone has a 2k dollar slide, nor do they wish to have one. We installed the same laser and activation switch into a standard Glock 19 [Gen4] and conducted all of the same function and accuracy testing. After we function checked the laser in the SAI slide, we swapped it and the components to a stock Gen 4 Glock 19. The difference was un-noticeable between the earlier version of the SAI and brand-new Gen 4 pistol. Aside from the rod spacer of the SAI, the fit and function were flawless. 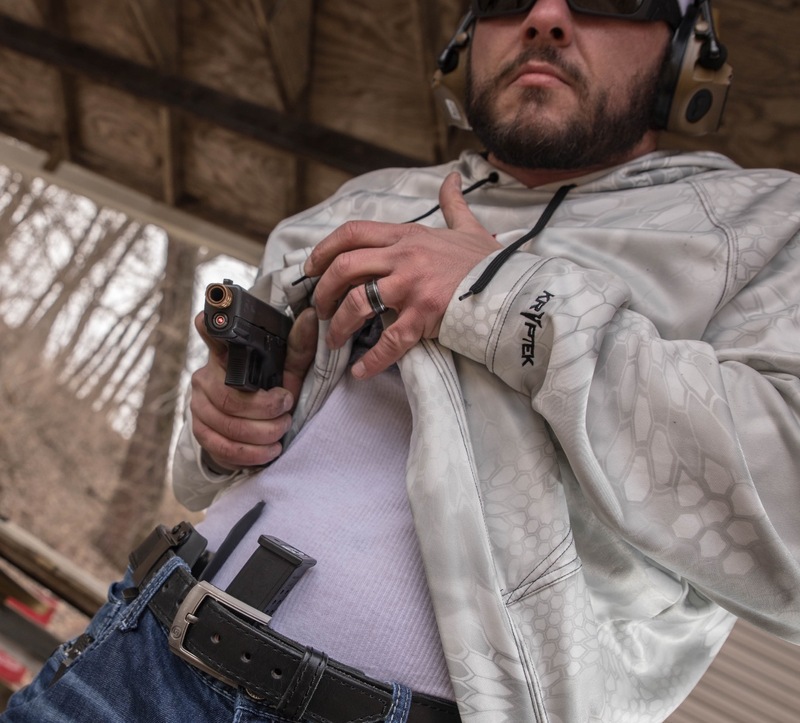 Drawing from the holster and making the conscious effort to activate the laser was about the most difficult step in the process; this was a simple adjustment to the muscle memory that we have been practicing for over a decade. We tested accuracy within defensive distances. LaserMax guarantees a less than 1-inch POA/POI variation within 10 yards out of the box. We tested the system at the same distance, out of the holster from a standing position and results didn’t vary too much from 1 inch. To co-witness, the front sight post and the lasers endpoint was easy, due to the pulsating reference. At first, the pulse was a bit distracting, but after turning on the shot timer and inducing a bit of stress, our eyes fixated to it and our opinion changed after the first box of Hornady’s Critical Duty ammo and drawing from a covered holster and into the A zone of an IPSC target. The farther we moved away from the target, obviously, the looser our groups got, and the lasers endpoint was not as clear definitive as it was at 10-12 yards. We engaged with close-in shots at 3 yards and incrementally worked our way back to 10. The red pulsating reference has a fixed brightness that our eyes naturally tracked upon activation. LaserMax takes into account the height of most standard front sight posts, which is where the reference point typically rests. As common sense suggests, optics or suppressor ready sights will cause the reference point to shift in height depending on the sights and their profile. Many, actually most weapons mounted lasers come with a zeroing process. Minuet adjustments with an exceptionally small allen or hex head wrench that typically results in over adjusting and a waste of ammo, before you’re comfortable with stowing the system in your holster. After the zero is applied and the shooter is happy with the groups, the zero process has to be repeated after shooting for a period of time. LaserMax factory “zeros” [for a lack of other words] the guide rod laser. 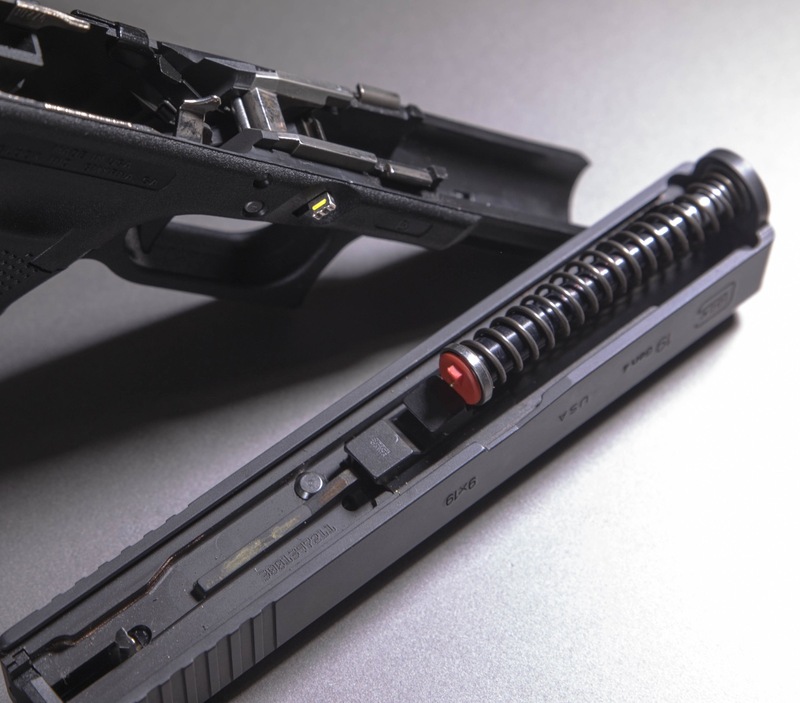 Each systems laser is aligned with the centermost point of the OEM barrel of the pistol that you have it installed into. Keep in mind…The fancier you get with aftermarket barrels and parts, you are flirting with the potential for more offset than from an OEM barrel…whether it be out of the box or over time. This unit will not be the cause of buying a new holster, a major turn off for many people when thinking about weapons mounted accessories. Most other weapons mounted lasers require a major modification to an existing holster or a necessity to buy a new one to fit. 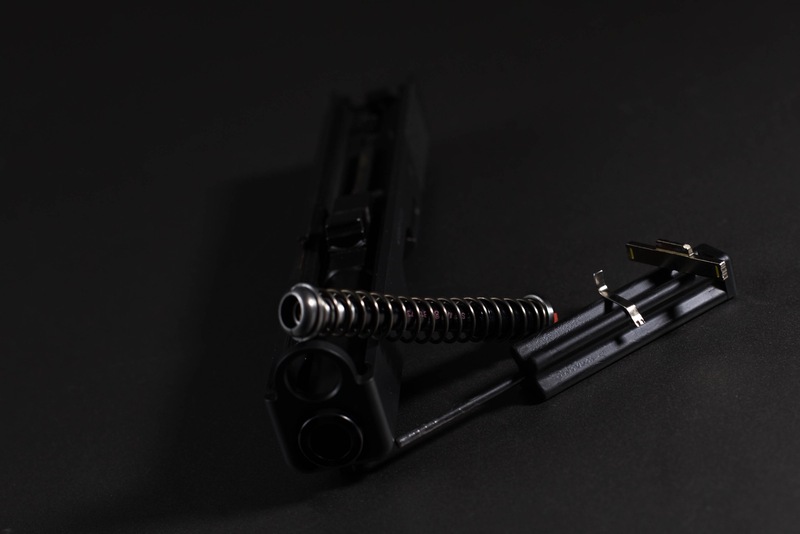 Since this unit replaces the factory guide rod, holsters modification or replacement is not necessary. As we have said in the past, shooting lasers [especially visible ones from pistols] is not necessarily in our comfort zone at this point. Again, making the conscious effort to activate the laser either while in the holster or immediately upon clearing it, is still a consorted effort between our hands and brain. This has nothing to do with the design of the system, it comes down to nothing more than another tool to add to the proverbial “toolbox”. LaserMax has been at the leading edge of weapon mounted laser systems for quite some time. It is no surprise that the guide rod laser is among their top sellers…simply due to its ease of use, installation, and accuracy. We live in a country that is more divided than we have ever seen it, there are more bad people that will stop at nothing to do bad things to good people and LaserMax is one of the companies in our industry that vows to increase survivability…so long as the end user is willing to put in the time to train, and become proficient with the tools they provide. The price point for the laser is scary at first, but the value [with regards to proficiency] greatly outweighs the price!